26 April 2009 - I participated in the First Aid Quiz organized by St John Ambulance headquarters today. Nothing special at all, we managed to kick out AMC in the first match and thus enable us to qualified to the finals with 2 other teams - Anderson and Ayer Tawar. Anderson get Silver whereas Ayer Tawar grabbed the Gold. Zero trophies for us. 'Us' = Wong Yoong Xiang, Fong Teik Sum, Eric Ewe Yow Choong, Wong Joe Hang & Me. By the way, congrats to cadet team who get Bronze. Yesterday I saw the horoscope reading in my friendster. It says that I should not start any relationship if Im not reading, Im just wasting my time. 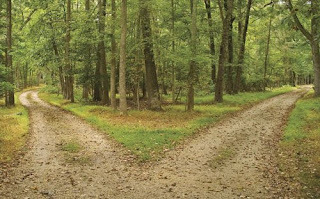 Then today = With all the uncertainty in your life now, you need to seek the comfort of home. Maybe Im not clear what Im doing right now. Sorry for disturbing! I will try to be more rational and stop the childish thing in me. Seriously, I hate those fella who always emotional (EMO) and talk bout the world's going to end or something like that. Sometimes I feel like Im quite near to that situation. I hate that part in me, that why Im changing now, I don't like the me who was in primary school. I want to be me right now. SPM. My mom keep on bugging me to study hard. June holidays is coming, Two 4 days 3 nights camp in 2 weeks time. I have to stop all my St John activities.... SPM SPM SPM!? Go to hell! 18 April 2008 - On the way to school, still sms-ing Joe Hang. Arrive school, realised my phone missing. Call my dad who fetched me there immediately. My mom at home answered it. I called my phone again. No reponse. 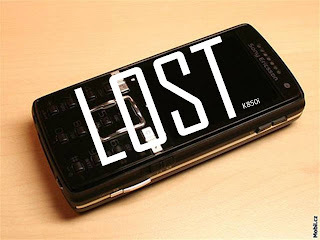 1 hour later - confirmed lost! 18 April 2009 - Today was the Annual General Meeting (AGM) for St John Ambulance of my school. Reached school super-early to prepare for my last meeting as an EXCO. Luckily the slide show for AGM can be viewed in the lecture theatre. The AGM officially started at 9.00am. Each and every EXCOs give out their respective reports and review for the term 2008/2009. I was waiting for this moments to come, to handover to the new board. 5 years is how long I have became a St John member, and this is the time! I believe that the new EXCO board can do a better job to improve the division, a greater teamwork in managing the members. Nothing much, view the photos below for a full review. 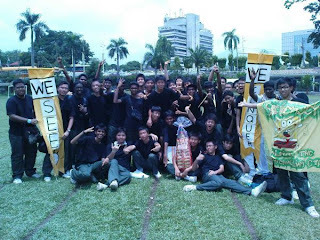 9 April 2009 - The last Annual Sports Day for me. Our class, 5sc4 have been training hard for this sports day event which ended at 1.00pm today. 5sc4 was lead by the class monitor, Lee Kar Heng and followed by the cooperative students in it. Our class was rewarded for our hardwork with a 3rd place for this inter-class marching among the form fives. Lee Kar Heng - The self-sacrificing, best monitor among the classes. He lead the class with his superb voice in shouting commands, organize the students and patience in bringing up the name of 5sc4. 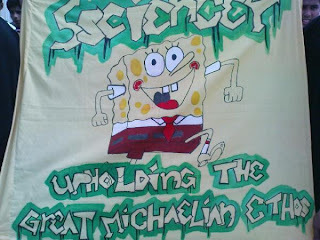 The only form 5 class who have the banners 'WE SEE' and 'WE CONQUER' thanks to him. Karavin - Although he seems to be playful sometimes, but he showed his class spirit when he offer himself to buy the black GIORDANO™ tee shirt for all the students as our class shirt. Beh Peng Cheng & Vincent Tang - Thanks for the wonderful yet amazing formation. Both of them contributed in designing and organizing our class formation. Chow Swee Kwan - The one and only who design and paint our class flag. Designed by, painted by and edited by him. Last but not least, ALL 5sc4 students who came for this glorious and meaningful Sports Day. Thank you. The performance of the adult team was good and surprising. I myself who recorded their footdrill session was stunned by their amazing performance. Unfortunately, other teams in and around Perak were better and thus, zero trophies for their footdrill. The adult team's short case and long case was satisfactory. Seriously, their performance is way better than area-level competition. From what I observed, they have the confidence to win and at last, bronze for both their short and long cases. Cadet team was not so disappointing after all. Their leader, Donivald Tham raise the impression of their team with his voice in their footdrill session. A stunning Silver was awarded for their footdrill and uniform checking. Short case was quite good, coordination and teamwork surpass most of the teams. Long case, hmm... it was funny. There was a casualty lying unconsciously, they found the medication, they put the medication inside the casualty mouth. Ahem, is this competition or real case situation? I doubt myself.